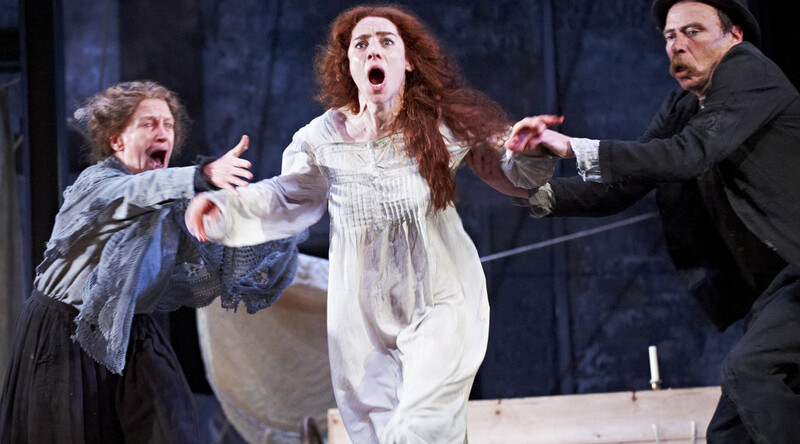 The Plough and the Stars was the fifth play accepted by the Abbey Theatre. It is described as a tragedy in four acts and is dedicated “To the gay laugh of my mother at the gate of the grave.” The first two acts are set during November of 1915, acts two and three during Easter Week 1916. It has a cast of 16. The central character of the play is Nora. Nora is married to Jack Clitheroe a bricklayer but they have to share their two-room tenancy with her uncle, Peter a labourer, and cousin The Covey, a fitter. She aspires to a better home for herself and Jack and the baby she is carrying. Her rooms are often invaded by other tenement dwellers; Ginnie Gogan a charwoman and her consumptive daughter Molser, Bessie Burgess a street fruit-vendor and Fluther Good a carpenter. All these characters show the rich humour and resilience and the language of the people O’Casey knew. In the first two acts Jack is becoming worn down by this married life and finding that he has been promoted to officer in the Irish Citizen Army (ICA) leaves to fight the British against Nora’s pleadings. In the pub the citizens of the working class are excited by the bloodthirsty rhetoric of the Figure in the Window. The next two acts takes place some months later during the last phase of the failed uprising. The British war-ship, The Helga, starts to bomb Dublin’s North Side. As Jack retreats along the street where they live Nora rushes out to bring him home and to safety. He is forced to push her away in order to leave with a dying comrade causing her to miscarry. In the final act, set at the top of the house in Bessie’s attic room, Nora has gone mad. Her dead baby lies in a coffin in the arms of Molser who has died of consumption. We learn that Jack has been killed by the falling roof of the General Post Office the ICA were holding. Left alone with Nora as the others are taken off by the British Soldiers Bessie is shot by a sniper as she tries to drag the demented Nora from the window. Ginnie arrives too late for Bessie and takes Nora to lie in the bed left by Molser. Two English Tommies drink the tea Nora has just made as they sit next to the body of Bessie and Dublin blazes.